This plugin is only for the Vantage Theme home page. The only idea behind the plugin to give new look to your website’s home page easily through a widget without any developer help. 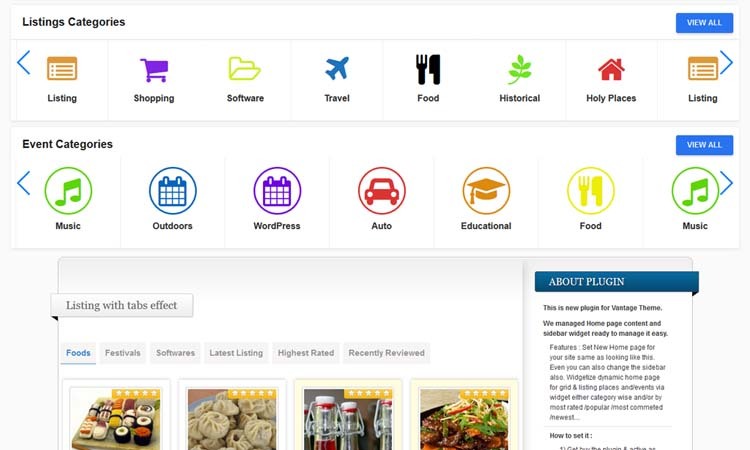 Most business listing websites have such listing views (listing & grid view) mainly for home page so we have decided to provide such features for users who can easily manage via plugin. This plugin makes the Vantage theme home page widgetized and easy to set. The plugin creates a new page template which will make your home page widget ready controlled by the settings page from wp-admin > reading settings. Manage both home page content section and sidebar from the widget area. If there is no sidebar set for the new home page, it will work with the default sidebar. 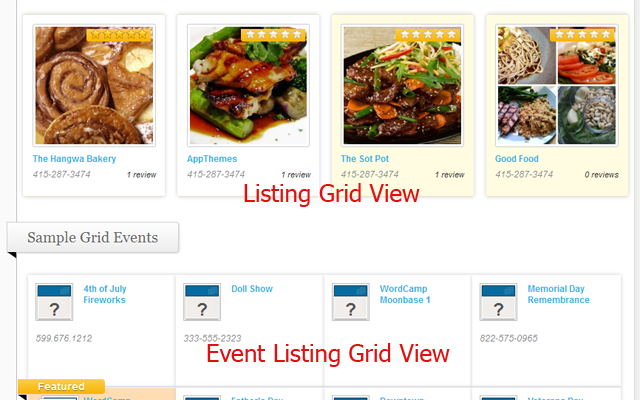 The plugin will add two additional widgets for lists and events for normal listing & grid view. You can also use/drag-drop other suitable widgets like a text widget to show your content or as per your idea. On each grid listing you the mouse hover effect which show you details for that record for both lists & events. Plugin totally changed as per Vantage theme version : 4+. So now normal listings and events section removed if you have installed vantage theme version 4+ or higher. 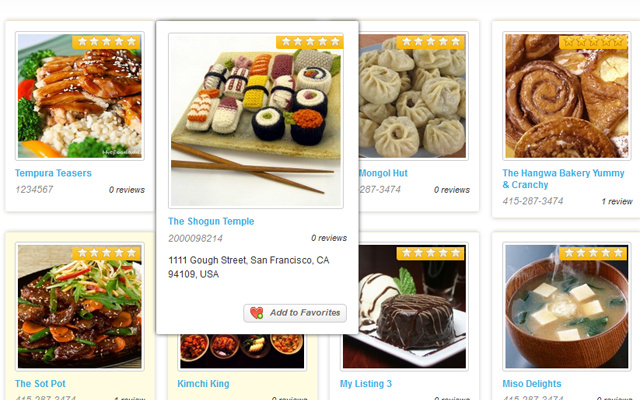 Now available with tabs to display more than one category or more listing & save space for home page. Tab feature added after version : 1.0.0.1. Note : The tabs feature is added only for listing not for events. Vantage home page widgetize and easy to set. Create new page template and make your home page widget ready. Added new widget area for both content and sidebar section of page template. Additional widget for listing list & grid view. Additional widget for events list & grid view. New tabs feature added for listing of both grid & normal view. Use other suitable widgets like text widget. Attractive hover effect to show details. Show lists for Featured, Highest Rating, Most Ratings, Alphabetical,Newest,Recently Reviewed, Random Listing wise. All above features for both listing & events. Use as simple page without set as home page. Display banner slider by using “Banner Slider For Vantage“. 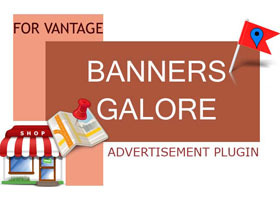 Image gallery by using “Banner Slider For Vantage“. Page template “page-vantage-newhome.php” totally changed and become dynemic now. “vantage-newhome-style.css” Css file removed from theme root and added in plugin itself for easy update every time and no headache for replace every time on every update. Grid style listings display good. Use the plugin widgets for theme home page. Plugin additional page template gone. You can also use additional plugin page template if you want in place of theme home page. Pages with sidebars are removed and now you can set only full page display only. Use plugin widgets for theme home page because now the theme home page is also widget ready. Display listings & events category with attractive icons and different colors. Set category icon in slider mode and auto slide. Different display styles & settings. Display either all or selected only non-empty parents categories. View all category button option. Widget title & sub title settings. Display listings by Featured, Highest Rating, Most Ratings, Alphabetical, Newest, Recently Reviewed, Random, All other listings categories. Show/hide widget data for mobile device. Display events by Featured, Popular Rating, Most Comments, Event Date, Newest, Recently Discussed, Random, events title && All other events categories. wp-admin >> Listings (left menu) >> Home Control Vantage — All options totally changed and added so many features. Events related settings(featured removed as per vantage theme version : 4.0+). Events category icon settings(featured removed as per vantage theme version : 4.0+). Right Sidebar >> Page with right sidebar as per theme design. It will display all parents category list with “ICON” & “COLOR Code” add option. Add Icon code from example url given. ==> What is the plugin for? The plugin is only for Vantage Theme Home page settings. ==> Plugin is not working for me? If the file is not added you should add both files from plugins/home_control_vantage/templates/ to your theme root folder. ==> Why files not created/added in my theme? Because of files/folder security problem, the plugin can’t able to transfer the files to your theme folder. ==> How to it’s working for wordpress multisite? You can use the plugin for multiple site but as the plugin create page templates related files only once for main theme (current active theme), and if you are using more than one theme for multisite, like child theme , vantage original theme, you should check the root folder of all those themes and place the files manually. Please refer FAQ of product detail page for more details. 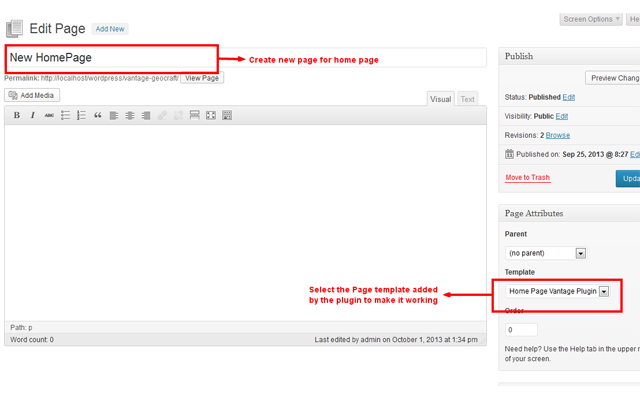 1)Go to wp-admin > Pages > Create new page > example “New Home page”. 1)Go to wp-admin > Widgets section – you can see additional two widgets added named :: “Vantage Home Listing Grid” && “Vantage Home Events Grid”. 2)Go to wp-admin > Widgets section – you can also get two new additional widget areas named : “Home Content Area” && “Home Sidebar Area” both for home content page & home sidebar only. 3)Go to wp-admin > Widgets section – you should drag & drop the above widgets in above widge area to get it working like demo. ==> Is plugin working with vantage child theme? Yes from the plugin is working perfectly for child theme. It may be a little bit problem of CSS but the grid and every thing should work OK.
– But again the important thing is the parent theme must added below plugin template files at root folder. ==> How can I set tabs for listing widget? There are maximum of 6 tabs addition option given with plugin. So you can show 6 tabs of different categories (you should add category ID in input box) or latest listing or highest rated or recently reviewed or alphabetical…..
==> How can I set single listing view without tags? First tab is by default, if you want to show listing without tabs you should make settings for tab 1. If there is only one tab settings, it will not display as tab only like listing without tabs. ==> How can I set category wise tabs? You should add tabs title and category id as per you want to display & your tab listing will display as per category id added. 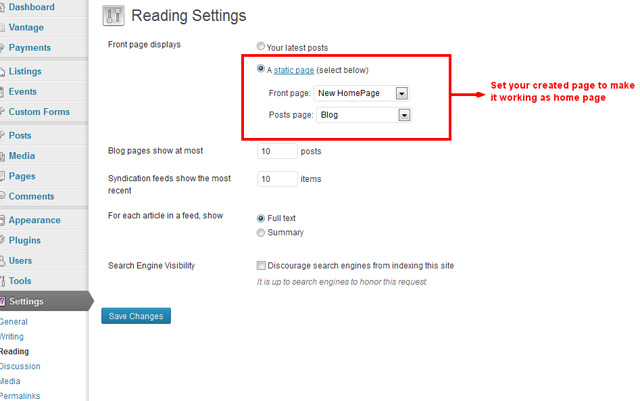 Go to wp-admin > Pages > Create new page > example “New Home page”. Go to wp-admin >> Settings(left menu) > Reading >> set the option “Front page displays” >> A static page (select below) >> see “Front page:” and select your created page as per above. — See all widgets starting with title :: WPWHCV …. Go to wp-admin >> Appearance(left menu) >> Widgets >> Widgets section – you should drag & drop the above widgets (7) in above widget area (8) to get it working like demo. Go to wp-admin >> Listing(left menu) >> Home Control Vantage >> See plugin settings. 11) Read Usage, Notes & Developer Notes Carefully. 12) See the screen image attached with the plugin folder to have visual help. Because of files/folder security problem, the plugin cannot able to transfer the files to your theme folder. If the file is not added you should add both files from home_control_vantage/templates/ to your theme root folder. Now you can check the wp-admin > Edit/Add page section > Check page template from “Page Attributes”. -The working copy of same files are places at your current theme root folder while you have active the plugn at first time. -So for every update you must replace both files manually (via ftp or from wp-admin > Appearance > edit files). -If any change done by you in past please backup the files before replace. — Added many design variations for plugin page template. — Full screen size content, variable content size, home page with left sidebar & home page with left sidebar. — Plugin page template settings & variation removed in last plugin update — Added again. — Removed depreciated functions as per theme older version. — Plugin settings was removed by mistake and we solved and add again so it will work ok.
— Solved many PHP warnings & errors from plugin settings & front-end side. — Plugin settings url changed on plugin activation page which not working in previous version. 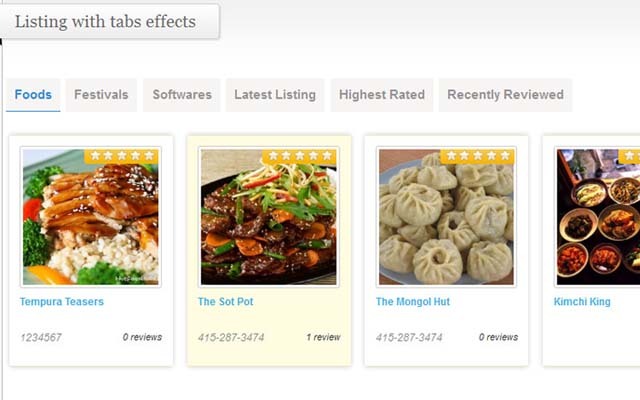 — CSS improvement for listings. — Listing slider plugin design changed. — Remove older theme version (for theme version less then version 4.0) theme support. — Removed normal listings and only grid listings available. — New updated plugin not working without “Banner Slider For Vantage” plugin. So related problem solved. Now working without “Banner Slider For Vantage” also. — Grid style listings display good. — User the plugin widgets for theme home page. — page template “page-vantage-newhome.php” totally changed and become dynamic now. — “vantage-newhome-style.css” Css file removed from theme root and added in plugin itself for easy update every time and no headache for replace every time on every update. 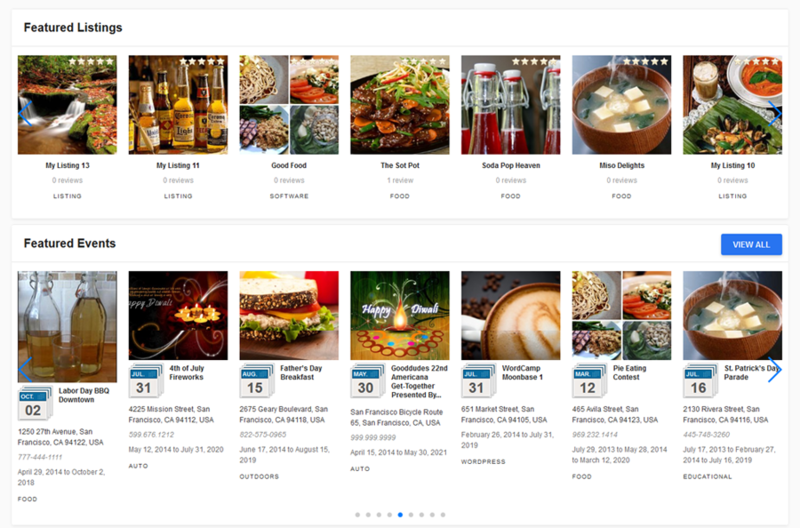 — Display listings & events category with attractive icons and different colors with different display styles & settings. 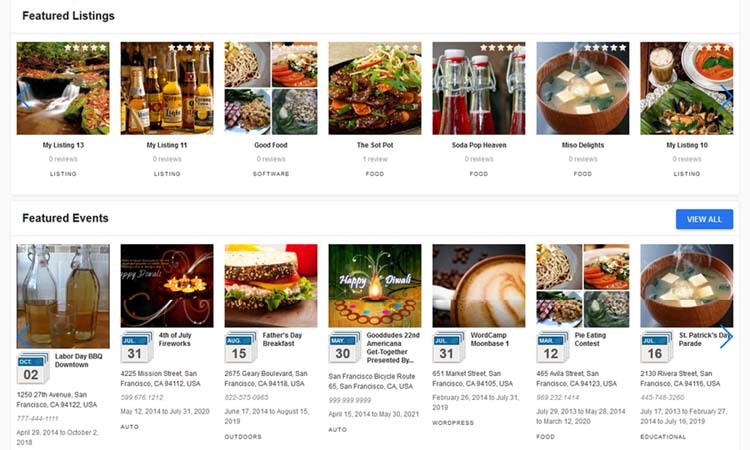 — Display listings by Featured, Highest Rating, Most Ratings, Alphabetical, Newest, Recently Reviewed, Random, All other listings categories. — Display events by Featured, Popular Rating, Most Comments, Event Date, Newest, Recently Discussed, Random, events title && All other events categories. — wp-admin >> Listings (left menu) >> Home Control Vantage — All options totally changed and added so many features. — Listings category icon settings. — Events category icon settings. — Right Sidebar >> Page with right sidebar as per theme design. — It will display all parents category list with “ICON” & “COLOR Code” add option. — new option added for widget to display event grid view as list grid view format. — For home page >> page template > while creating the page and added the content for page, it will display at starting of page. — Updated file : page-vantage-newhome.php >> please replace the file with your current active theme/parent theme root folder. — Text widget for home controller page and other widget default desing related settings – done. — Multiple Listing Type display settings added (Tabs view) for LISTINGS ONLY not for events. 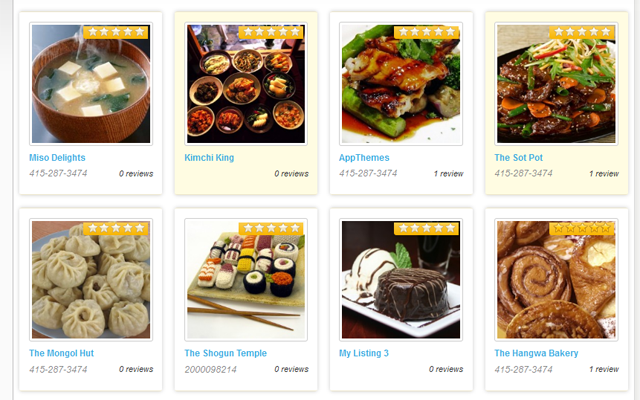 ==> you can display more then one listing category in tabs view. — NEW FEATURE : TO make your complete site grid format. — with options to set either listing and/or search listing grid/list options. Now you can see whole site either grid/List View. — Pagination for grid working ok but now working for listing was show error for more than one widget – solved. — New options added for listing & event home widget plugin related to height,disable mouse hover option for small device. — multiple size screen issue, solved. The working copy of same files are places at your current theme root folder while you have active the plugn at very first time. So for every update you must replace both files manually. If any change done by you in past please backup the files before replace. — List hover effect enable/disable from widget settings. — List image show/hide from widget settings. — List short description show/hide option on hover. — List phone number hide option from widget settings. — List address hide option on hover effect from widget settings. — List reviews count hide option from widget settings. — List star rating hide option from widget settings. — Event hover effect enable/disable from widget settings. — Event image show/hide option from widget settings. — Event phone show/hide option from widget settings. — Event date show/hide option from widget settings. — Event address show/hide option from widget settings. — Event short description show/hide option from widget settings. files from “wp-content/plugins/home_control_vantage/templates/” to “current theme root” folder. Backup your current vantage-newhome-style.css in case you may have added any custom code. I have purchased Home Control for Vantage for Vantage Theme 4.1.4 version. But after activate the plugin I cannot have the big “Add an Event” button or “Listings” button. Event category. Related to your problem, it seems like menu problem, please check your menu settings from wp-admin > appearance >> Menu >> header menu (may be changed). We just activate & replace home page with plugin template page. I’m really disappointed that this plugin doesn’t offer Grid and Normal listings widgets with Vantage 4.x, as it was an essential part of the way my site operated. Now I have to pay a programmer to customize it for me. A proposed alternative was to use the Grid Listing Slider, but it doesn’t function or look the same. It’s at least something though, which is why I’ve giving this 2 stars. I’ve got big problem on the Sidebar from the Homepage who can’t be displayed. I purshased this plugin for the very attractive WPWHCV Category Icons who works very fine. But, with this plugin, I cannot have a sidebar on the Homepage, so I cannot have the big “Add an Event” button or “Listings” button. This is a dead end on all my site if on a home page I can’t convince my users to use my web site. Maybe I make a wrong move on the parameters, but how can I make it works like on the “preview” (where we can see a sidebar on the Homepage ?). Thanks for your work, Maybe it is my mistake from my side, but for me today, this plugin have a big bug on it… What can I do to have a SideBar on the Homepage with this plugin ? I think you may have confusion for that. There are already widgets for 2 buttons with vantage theme already. You need to drag and drop. I have the same issues as yazhttg. The plugin works, but not correctly. The Events are not being displayed and there is no pagination on the listings. Please inform me how can I get a refund! A good addition to your plugin collection. It offers pretty looks and semi-profesional dress up for your web site. 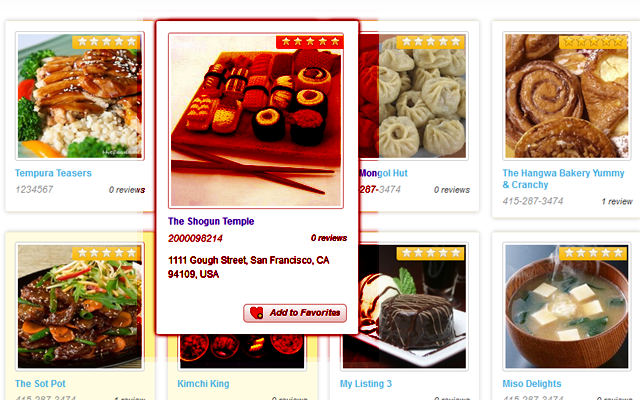 Some minor aesthetics details: “More listings” button is an ugly & lazy solution to pagination. A little confusing installation, you may end messing up your home page and home page widgets if you don’t understand what you are doing. Useful plugin after all. A little expensive IMHO. I bought it because of promotion discount last week. I really like the home control plugin, and so do my customers. I set it to display random listings and so it always makes the page look fresh. My vantage site offers free listings for 12 months and these display on the home page – revenue comes from footer ads. Home Control has worked well, once I read the installation details fully. Simple to set up, and help reponse was great, when I did need it. I rely like the home control plugin and so do my customers. I set it to display random listings and so it always makes the page look fresh. My vantage site offers free listings for 12 months and these display on the home page – revenue comes from footer ads. Home Control has worked well, once I read the installation details fully. Simple to set up, and help reposes was great, when I did need it. I was about to give a 5 stars to this plugin but since I cannot get the Pagination for Grid (as it is possible in the default Home Vantage page) to work and the ability to be able to select a specific date or date range for Events(as it is possible in the default Home Vantage page), I have no choice to give no more than 4. As soon as those little features will be added… that will for sure be a 5 stars pluging for Vantage. Not working... want a refund. I purchased Home Control for Vantage and have not been able to make it work correct. Gone through all the support, documentation, etc.. I give up and do not want to waste any more time on this. Could not find a place to apply for refund. How can I ASK FOR A REFUND? We have updated the plugin and now it’s working ok.